Hoverboards are the latest innovative transportation gadgets in the markets all over the world. The Hoverboard riding is one of the most effective ways to spend your holiday by taking a smoother ride around your place; it comes with a different running speeds. A faster Hoverboard can make you to cover a longer distance within a short time. The self-balancing scooter works on a rechargeable battery so you may travel wherever you need to go; you can use it for shopping, riding to the gym or take it to your office. When you are riding with this board you need to lean front and back which strengthens your sense of balance and your reflex movements. It also require considerable amount of skill and fitness to use the Hoverboard and also offers an unexpected health benefits for you. It gives an enthusiastic experience for you so you may feel very fresh and dynamic. When you start to ride a hoverboard, your posture is very important because you need to keep your back straight as well as the whole body gets a complete workout. The Hover board gives you a lot of fun but you need an appropriate balance to enjoy the fun-filled activities. Riding the hoverboard has become a greatest trend so the kids, adults and teenagers love to spend the whole day by using it. The rider must be very familiar with the hover board speeding up, moving backwards, turning around and then move to the highway to avoid accidents. It is not too heavy to carry because of its cute size and lightweight and it is easy to maintain also; if your scooter is lacking power then you can fit it to ac power when the hover board battery is full it will automatically shut down. It is one of the best self-balancing scooters which are capable of handling any type of area or terrain and it gives you a smoother riding experience. It is constructed with a solid rubber tires so that it may be working better in all terrains; it is very popular in the market because it is ultimately designed with high-quality materials. It is modeled with a front and rear LED lights to provide a good visibility for the road so you can confidently make your ride safer even at night times and also it makes your self-balancing scooter’s ride easier to spot. The EPIKGO Balance board also has rubber pads with extra cushioning, LED headlights and turn signals and high-quality trackpads on its two wheels. It has a long-lasting battery life and it gives lot of fun for you and allows you to climb, turn and move across a horde of terrain. With a single charge you move more than 10 miles for a day. 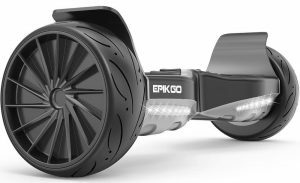 The EPIKGO is designed with more 30 percent larger hoverboard that gives an extraordinary weight capacity and makes the adult to enjoy the self-scooter experience. 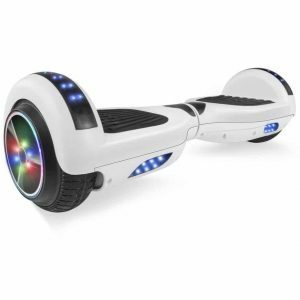 It also offers a Sport plus model with more powerful motor and a Bluetooth speaker; this hoverboard is water-resistant so that you can climb even at 15 degrees by flashing the LED lights. It is the lightweight design so you can move it around easily without any strain; they deliver you the faster and smoother ride. The Segway mini pro combines the typical self-balancing scooter with the Segway esthetic to create a hands-free transportation for those who love to enjoy the ride. It offers the safer and simpler experience and also has a Bluetooth app so that you may change the color and pattern of your LED front light; the scooter can be controlled remotely using this app. It is designed to function effectively in case of ambient light environments; if you want to ride at day or night the automatic headlight and LED taillights will make your way visible. The Segway lights are adjustable so that you may customize the brightness of the headlight it also accurately combines the visual and safety appeal. It is modeled with a distinct knee bar which is very essential to make your ride very comfortable; it has 10.5-inch air filled tires to provide more stability to ride at different types of terrain. It is powered up with a lithium-ion battery on board so it can move up to 14 miles with the speed of 10mph. 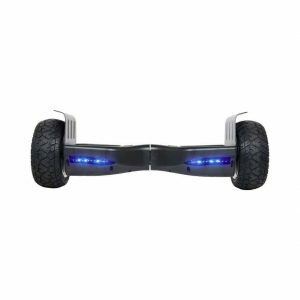 The Segway hoverboard has many sensors which allow detecting the smallest movement from the rider and adjust with an amazing speed; it offers extra safety and stability for all riders. It comes with an Android or iOS app which can be used for different functionalities and includes persistent and stubborn safety instructions; it also notices the speed and charge levels. It looks very stylish and the most expensive one which gives you a lot of fun. The Skque x1 series scooter is one of the amazing products and it is pretty simple to ride. It is the longest and durable Hoverboard by which you can move more than 20 miles with the single charge because a high capacity lithium battery powers this scooter. The Skque X1/I series-UL2272 is an emerging top rated Hoverboard that supports 264 pounds. It is built in with a professionally turned gyro sensors which permit you to move in any directions. 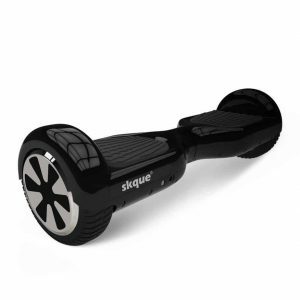 It is the most powerful black themed Hover board with a standard UL certified design. It is the most popular smooth riding hoverboard which is designed with LED headlights, rubber footpads, and the quality rubber provides you the enjoyable ride with style and comfort. It is one of the craziest waterproof hover boards which offer many features like Bluetooth speakers, stylishly designed LED flashlights and app for smartphones. It has a durable battery power if you are moving very fast an alert sound will remind you to go slow to avoid overheating. If you love to ride with this hover board then you may get an opportunity to connect your smartphone via Bluetooth connection or through SURFUS App and listen to the music. For better visibility and look the SURFUS hoverboard is fixed with brighter LED flashlights. It has the lightweight design so you may use it move around quickly and easily; the risk of injury or slipping is less because the non-slip foot pads make it impossible for your feet to unintentionally slip or skid. 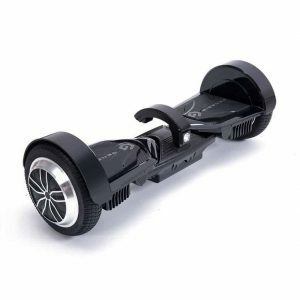 Whether you are riding at day or night this waterproof hoverboard provides a compact and fun-filled experience. The Jetson V8 All Terrain is one of the scanty hoverboards that come with adjustable speed settings; if you ride very faster or slower this product will be the right choice for you because it can control the speed. The puddles cannot harm the device because it is water resistant. It has very strong and long lasting tires with futuristic design along with front and rear LED flashlights so you can go for a ride at dark spot also. It has two 400W motors for both sides with three driving modes so the rider can be more comfortable on the hoverboard. The Jetson V8 model has a Bluetooth app which can change your riding modes, check the battery life and able to view the location you are moving. The quality of the battery is really amazing and it has an impressive range. This hoverboard is created with an independent gyro which makes your ride dynamic and improves the control so that you may shift your body smoothly at all types of terrain. You can use non-slip foot pedals and 8.5-inch tires to make your ride very cozy and smoother. If you own a Bluetooth- smartphone you may download many interesting apps, songs or movies and enjoy the ride. 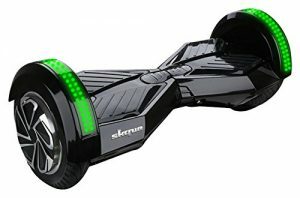 The Swagtron hoverboard is the most popular self-balancing scooters in a market; it has a sleek design which makes the hoverboard to look very attractive. It is also very comfortable for children because of its lightweight structure. 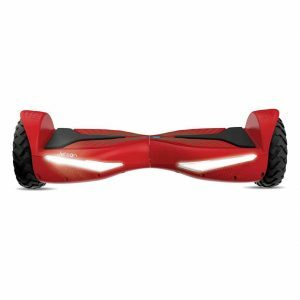 It is available in many different colors and style so you have a lot of choices to select the modern and fashionable hoverboard. The battery is very durable which gives you the long-lasting power; the full charge can give you the power up to 7-12 miles. This hoverboard gives you an alert when there is less amount of charge and saves you from injuries when you are riding very fast on the road. To improve the visibility there are two LED lights fixed on the board, upper lights will give you the notification about battery level and the side lights will help you to identify the vehicles and other things on the road while you are riding. It is very flexible because the wheels are remodeled so that you may feel very comfortable on your hoverboard, you can keep one foot on the ground and another foot on the board; this will help you to balance well without any slips or skid. It uses an advanced gyroscopic methodology so this hoverboard will be quite feasible to operate and offers an enjoyable ride with a lot of smoothness and stability. The footpads are softening enough to come up with a flexible grip so that the rider can get a good balance and control while riding. The XtremepowerUS offers the self-balancing scooter for entertainment so that both kids and adults can enjoy a lot and have fun; the scooter can move front and back in any direction. You can also connect your smartphone to the Bluetooth speaker while you are riding along with friends or a family member which adds extra fun. It also has a built-in LED front and rear lights which makes your path visible during night time also. This hoverboard will not function properly on rough terrain, so it may not be the right choice for those who live in such areas. It is available in a variety of colors and designs. This will be the suitable hoverboard if you want to enjoy and ride for outdoor activities and also offer an ease for users. The XtremepowerUS allows you to climb in a better way just roll one foot on the ground and keep another foot on the board and have a smoother ride. It is ultimately designed with high-quality materials so you can enjoy using it daily and it has a durable design. The battery life is very powerful which can stay for even months with a single charge. The wheels are large and compact, the 6.5-inch wheels can have a heavy duty design which can work well on all type of terrain so most of them like its smooth rolling designs. The Skque self-balancing scooter is super safe to use it is newly designed with an upgraded motherboard and with improved gyro sensors so you can enjoy a smoother ride. 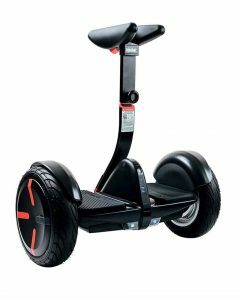 It is an attractive and eye catchy scooter that helps you to transport anywhere. The entire model is covered with top quality material so it can last for a long time and highly durable; it also has a built-in wireless Bluetooth speaker so that you can connect it with your Bluetooth enabled smartphone and enjoy the music while you are on the move. You need not worry about night rides because the scooter is made with brighter lights that may make your spot visible. This hoverboard is constructed with a heavy inner and outer shell so it provides a comfortable ride and a great durability. The two-wheeled balancing scooter is very portable and it is easier to control and balance it has a sleek look which can attract everyone to ride. It is designed with two drivers motors placed on the wheels which have a good grip to move in all directions; each wheel operates independently so it may be easier to stop, turn or ride. If you are on a large campus, it may help you mauve from one block to another very easy and great to use in indoors as well as outdoors. The Genesis H1 Gemini Hoverboard can be well suitable for fun rides that can maximally go up to 12 miles per hour; you can also play music via Bluetooth and enjoy the ride. It has a durable battery power so you can reach the destination within a single charge for 10 miles. The 7.5-inch tires are used so you can climb the hills without any disturbance and has a powerful headlight to travel at any time. The Genesis Gemini Hoverboard has a mobile app that may allow you to change settings, track the location, and check the battery life, speed and more. 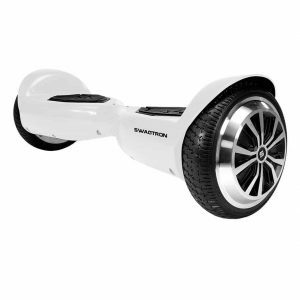 It is the lightweight Hoverboard so it may be easy to mount and ride. The Gravity sensors can make the board more sensitive to your foot position and it can control the board very effectively. It is simply a high quality, well functioning board and has a lot of safety mechanisms to prevent the rider from injury and safe to enjoy the world at their feet. You must keep an eye on a battery while charging it should not be overheated to prevent any accidents to your board. The Hoverheart hoverboard is one of the best products because of its quality and reliability; it has a compact and sleek design so it may be easy for you to transport it from one place to another. It has a built-in Bluetooth speaker so you connect it with your smart phone and enjoy the music while riding; this gives you an extra enthusiasm to go for a long ride. The LED lighting to this board makes it, even more, brighter and attractive, it also has another benefit which is you can easily travel with this hoverboard even at dark night times and have fun. The wheels are 6.5 inches that can give a good grip and control when you keep your foot on the board, it comes with a better flexibility and versatility. This hoverboard is designed with an extremely high-quality material so it may be durable and can last for a long time. The design is simple and fascinating; its lightweight feature allows you to carry the hoverboard to any spot wherever you like to ride. This will be the great self-balancing scooter for riders with a wide variety of colors and designs. The hoverboards can take a maximum of 2 to 3 hours to charge fully so that it may have the potential to run to two hours that covers a range of 10 to 12 miles on a single charge. You must be clear that before buying a hoverboard it is essential to ensure that it has a long battery life with short time to charge. The battery life depends on the speed at which one moves the surface terrain with the rider’s weight and a battery life. A good quality hoverboard will come with a nice charger; if you want to enjoy a long time of riding keep an extra pack of battery. The hoverboards are constructed with different wheel sizes with 6.5-7, 8 and 10 in common. Each size offers distinct benefits for the rider; the most classic size is 7 inches which cover the maximum distance of 12 to 15mph. The big wheels raise the board so that there will be more space to move over the obstacles and there may be less bruising of the body of the hoverboard. The small size hoverboards are better to use it indoors because of its lightweight; it covers the range of 12mph. The 10-inch wheels are suitable for outdoors so you can enjoy a smooth ride at a different type of terrain. The hoverboard can move for six miles per hour, but the fastest scooters can reach as much as fifteen miles per an hour. The speed is determined by the power of the motor, the wheel size or any other factors; the actual speed can differ based on the weight of the load and terrain. 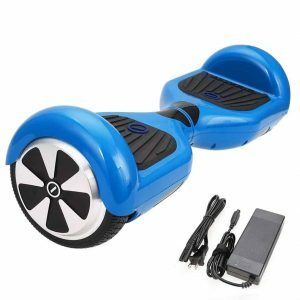 There are more specialized models that can move at a higher speed like Jetson V8 all terrain and EPIKGO self-balancing scooter if you love to ride your hoverboard outdoors on a tricky terrain then either one of these models will be an excellent choice. Most of the riders move between 6-8 mph and this is the preferred speed by hoverboard lovers. If you want to carry your hoverboard for outdoor then you must check the weighs; the actual weight is 20 pounds if it is more than the average weight then it will be a burden for you to take around. It is very tedious to identify how well the product is constructed, but there may be a wide range of difference between the build qualities with hoverboards. You also need to bring a charger along with the hoverboard if you wish to climb up on any type of terrain; most of the models claim to have enough torque and a power from 5 to 10 degrees. If it is portable then you may use it an enjoyable ride and have a lot of fun with your friends and family members. I hope that the above-mentioned products may help you to choose the best hoverboard so that you can enjoy riding and have fun! Hoverboard riding gives you an extraordinary experience. Share your thoughts if you have the experience before! I love hoverboard riding. It gives me an extraordinary experience. I used to carry my hoverboard with me in all outdoor activities. It gives me more excitement and fun. My hoverboard is the best and it is XtremepowerUS self-balancing scooter.